One method for possibly making a tidy profit before the patch in a couple of days involves buying up cheap runes and sigils or investing in dearer versions that you think might get a bit of a boost with the changes to runes and sigils. Staffs, hammers, longbows, shortbows, greatswords (and any two handed weapons I've missed) can have 2 sigils, not just one. Some runes are being tweaked to allow for some popular hybrid rune combos right now. The hidden rules behind sigil activation are being adjusted. 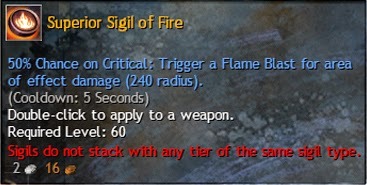 Point number one means that most players with a two handed weapon in at least one of their weapons slots will be buying an extra sigil. The most popular sigils will increase in price. This ties in with point number 3, which will see a reduction in shared cool downs and an increase in proc chance for on hit and on crit runes (and sigils) - certain impossible (or pointless) sigil combinations will become both possible and quite desirable. Point 2 means we may see some big changes to certain rune sets, changes that result in shifts in prices. All in all it's tough to predict what will happen. There will be much post patch calculating done in order to pick the best sigil and rune combinations (for the berserker meta for instance). When the dust settles either the current pick of the rune/sigil crop will remain 7g+ or, perhaps, some of the low to mid price crowd will rise to join them in the golden sun. I've invested in a few of the very cheapest and least desirable runes and sigils (runes of the undead for example) along with a slew of mid-priced options just in case. At the very least, it's highly unlikely I'll lose much money from this kind of speculation.